> Patented innovation: The blower with integrated controller has been patented in Europe. to integrate harmoniously with the towel rails, the blower is almost invisible, the towel rails aesthetics is preserved. 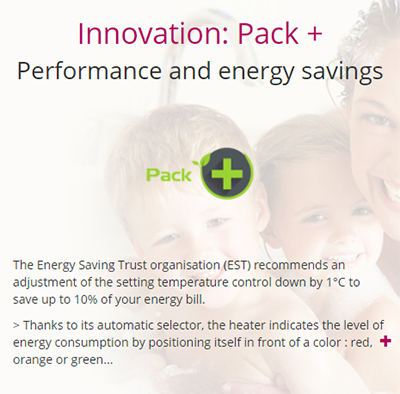 - additional heating: for a rapid temperature rise, switching on or of the blower, instant heat. > Easily accessible from the side of the towel rails, the removable dust filter can be cleaned with a little water and a sponge. 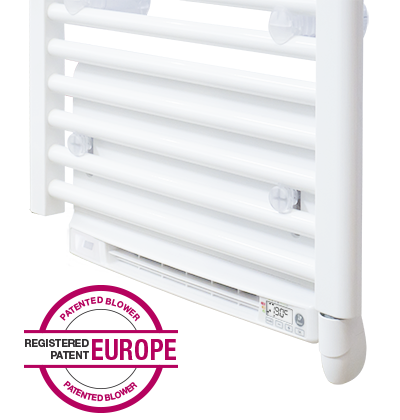 > With an innovative design, the blower fits perfectly into the towel rails. > The small footprint of towel rails with blower Néomitis® helps to conserve space in your bathroom. > Intuitive controls are digital and easy to use. The white backlit display ensure ergonomic use and perfect legibility of information. > Precise PID electronic control, the temperature remains stable over the seasons, the feeling of comfort is optimal. 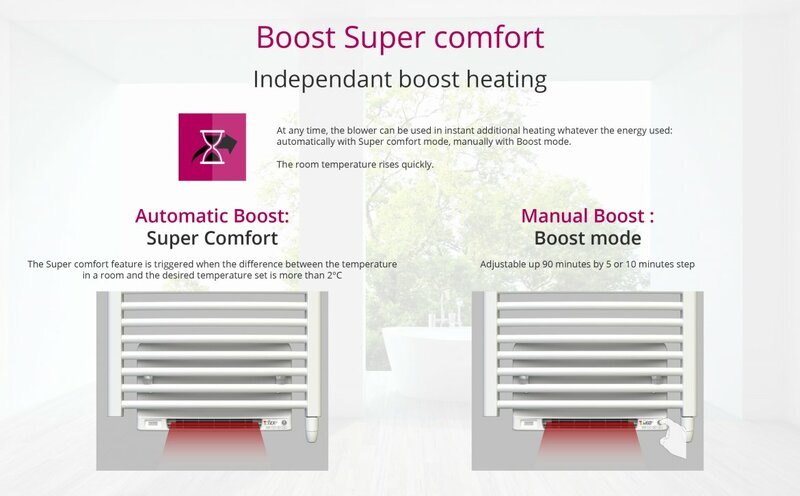 > "Super comfort" feature allows to accelerate automatically the temperature rises after a phase of Eco, frost protection or standby. 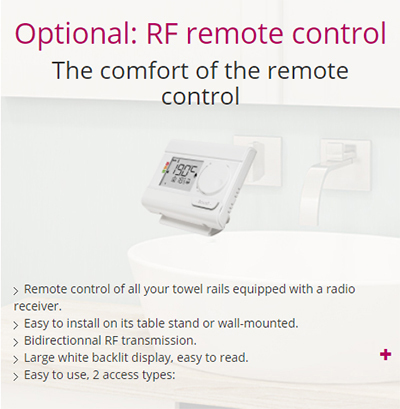 > The adjustable boost mode up to 90min by interval of 10min, rapidly rises the heat of the bathroom and enables quick drying of clothes or wet towels. > Maximum ambient temperature setting in "Boost" mode. 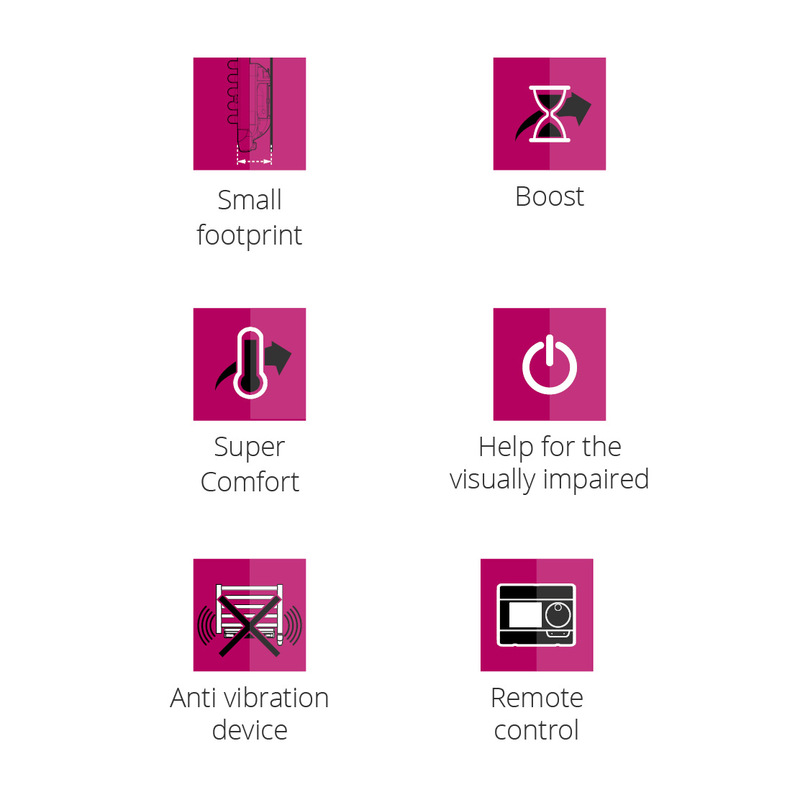 > Help for the visually impaired: the switch button heating on/standby is in relief to be easily identifiable to the touch. > Blower with tangential turbine and low noise, acoustic comfort. - Limits of the adjustment range of the Comfort setting temperature. 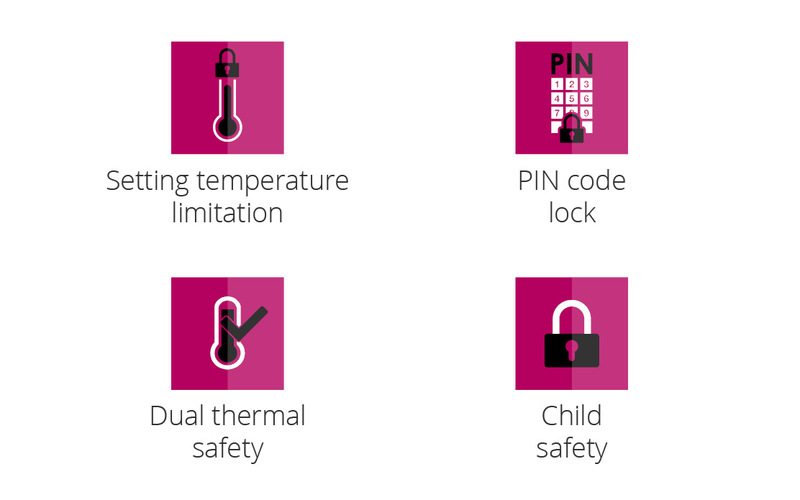 - Security level 2 : an integrated thermofuse triggers if the overheating extends beyond the limit authorised temperature. 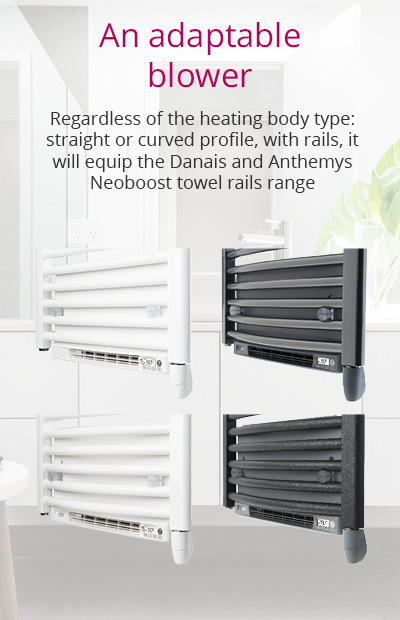 - Limit of the ambient temperature in case of boost : when Boost is activated, the towel rails should heat the room up to a limit of ambient temperature. When it is reached, the boost stops automatically. - "Keypad lock" unintentional changes are not possible, dispensation and modification possible by infrared remote control. - Switch heating on/standby located at the bottom to prevent unintentional support. > Security "anti-obstruction": the ambient air enters behind the blower and exits through the fins on the front face, in the lower part of the towel rail. In case of accidental blockage of ventilation grille or dust filter, the device switches to safety mode and the blower stops automatically.